So what's all the fuss about making things from scratch? you ask? I, for one, like knowing what I'm eating and feeding my family. Now, from time to time I do buy ready to eat food, but those instances are very few and far between. We enjoy eating out and that's not what I'm referring to here. I'm talking about frozen meals, ready sauces, spice pastes from a jar, canned pie filling, that kind of stuff. There are a few things that I will use, like tomato ketchup, mustard, wasabi / horseradish and that kind of stuff. I have found that for a little effort, you can make all of these things at home. They may take a little experimenting but almost always, the home made versions turn out so much better than the store bought ones. And once you try it out for yourself, you'll know what all the fuss is about. Making your own food from scratch is a good habit to get into. And once you try your hand at it, you'll want to learn more. It is addictive. I hate to come across as a snob, but I recently realized that in a pinch, I'd rather do a breakfast for dinner (fry up some eggs with toast) kinda thing rather than buying ready meals. If ready meals are your 'go to' option, try and keep an open mind to 'made from scratch'. You can control the sugar and salt in your food. And it is so much easier on your budget too. Where am I going with all of this? A while ago, I'd shared my recipe for Homemade Mayonnaise. You'll be surprised at how easy it is to make a batch. Okay, so you've made a batch of it. Now what? 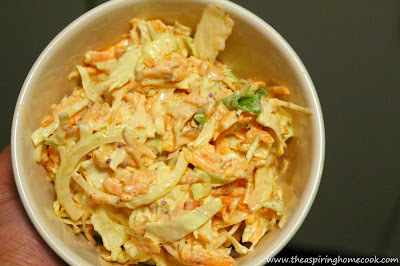 One of the ways, I use my homemade Mayo, is as a dressing in a Cole Slaw Salad. This salad couldn't be simpler. A few ingredients get thrown in a bowl and tossed together and you have yourself a yummy salad perfect for a barbecue or to serve with batter fried fish or fried chicken or even in a sandwich. I have posted a recipe for Cole Slaw before, but this one is a step up from that version with the addition of horseradish and mustard. And if I've piqued your interest about food made from scratch, take a look around my blog. You're sure to find recipes to try out. In a bowl, mix the mayo, horseradish, mustard and freshly cracked black pepper. Add the carrots, cabbage and onion and mix well. Your Cole Slaw is ready to serve.